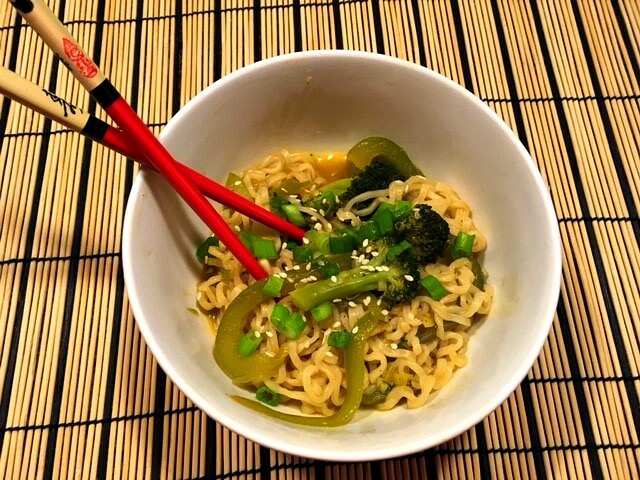 Ramen noodles: You are so much more than the rectangular block of noodles and seasoning packet that lay in most college dorm rooms, waiting to be microwaved and eaten. You deserve the accolades that come with being the rich, intricate bowl of goodness that you are. 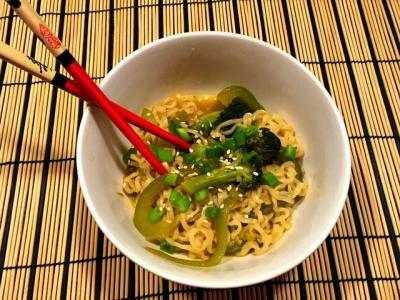 Ramen is a noodle soup that originated in China and replicated in Japan. It consists of Chinese wheat noodles served in a flavored broth, and customized with toppings, such as sliced pork, soft-boiled eggs or scallions. Typical ramen noodles are long, thin, and wavy. Ramen bowls are often classified by their flavorings: Shoyu (soy sauce), Shio (salt), Miso (soybean paste), or Tonkotsu (pork bone). When eating at an Asian restaurant, gyoza, or potstickers, which are pan-fried dumplings, are typically ordered to accompany the ramen bowl. While a broth-based soup is generally low in saturated fat, it is also high in sodium. Both ramen's broth and it's flavorings add lots of sodium to the dish. When making a ramen noodle bowl, buy low sodium broth, and if using the dry packaged noodles with the seasoning packet, discard the packet. Ramen can be a bit of challenge to get in your belly. Traditionally, it is eaten with chopsticks, and the broth is slurped directly from the bowl. However, if you're not a whiz at managing chops, or you're too embarrassed to slurp, a fork will help you twirl the noodles but not do anything to grab the broth. A spoon will help you sip the broth, but the noodles will simply fall off. Finally! A use for the spork! In a large stewpot, sauté bell pepper and carrots in sesame oil for 3-4 minutes. Add garlic and ¼ cup green onions and sauté for 2 minutes. Pour in broth; bring to boil. Add noodles and curry paste, and simmer until they soften and break apart. Garnish with remaining ¼ cup green onions.